I haven’t done a Chicken Wing Friday in a while and with football season starting, I think its time. Chicken wings and football are a natural pairing. The only thing that would make it better is a cold beer. 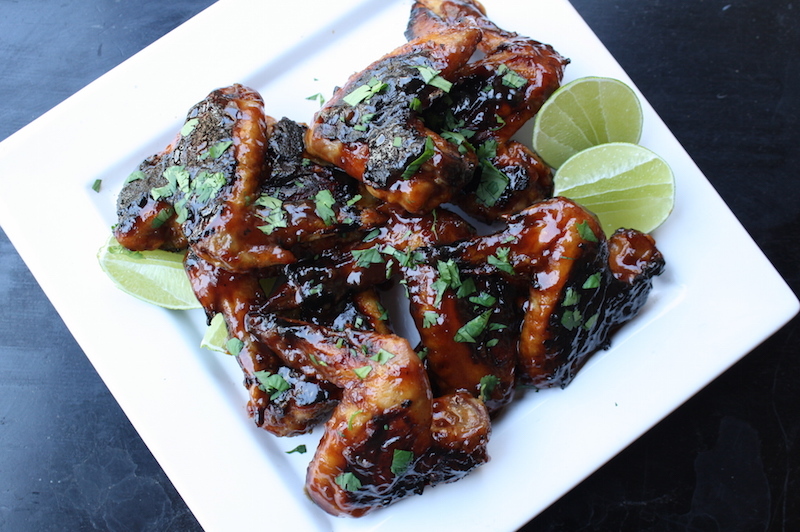 Today’s wings are sticky and sweet, tart and tangy and utterly messy. They’re perfect. And a cold beer only makes them better. I’ve been sitting on this recipe for some time, tweaking it now and again. It came from a project I had a while ago where I developped recipes for a chain restaurant that was looking for new appetizers, including a few new chicken wing dishes. My team was tasked with creating something different to set them apart from the competition, something unique and on trend. I put together a whole slew of options, pulling in flavors and influences from all over the world. Besides the traditional Buffalo sauce, barbecue sauce was incredibly popular in their restaurants to no one’s surprise. I took the flavor notes that make bbq sauce so beloved – sticky, sweet, tart and a little tangy – and gave it an Asian spin to mix it up a little. Delicious, familiar yet different and completely on trend. The sauce was based on Thai tamarind concentrate for that sour tangy note. Some honey for the sweet sticky element, red wine vinegar for acid and a bit of five spice powder, that blend of cinnamon, star anise, fennel, pepper and cloves, to bring it all together. I loved it. It had the essence of an American bbq sauce but with a very clear Asian influence. The client … not so much. Too exotic, I was told. Too unfamiliar, they said. Too weird, they mumbled quietly. I had plenty of other options so I wasn’t overly concerned and there were no hard feelings. That’s just how it goes sometimes in the big exciting world of culinary consulting. So I kept the idea for my own and last weekend, just in time for a great day of college football, I made a batch. I still loved them, mess and all. I roast the wings off with my current favorite method – high heat with a light coating of flour and salt. A bit of a baste two-thirds of the way through for some color then a good toss in the glaze as they come out of the oven. A squeeze of lime and a handful of chopped cilantro and it’s time to grab a beer and a giant stack of napkins. Tender, juicy, tart, sweet and tangy, they were perfect. There’s no heat in the recipe but it would take well to a spoonful of sambal paste or a squirt or two of sriracha if you’re so inclined. Funny enough, later that evening I noticed a wonderful side effect – my apartment smelled fantastic! Enough that I wanted to make them all over again. STRESS THERAPY BAKING FACTOR: FINGER LICKIN’ GOOD. There’s something wonderfully satisfying about tearing into a chicken wing with your hands getting all sticky and messy. It’s impossible to do this delicately or cleanly. The only option is to dive in, head first. Just get it done. The sauce has all the qualities that make bbq sauces so beloved – sticky, sweet, tangy, sour. It hits all the right notes and is so easy to pull together. For your next party where neatness is not a factor, make these. 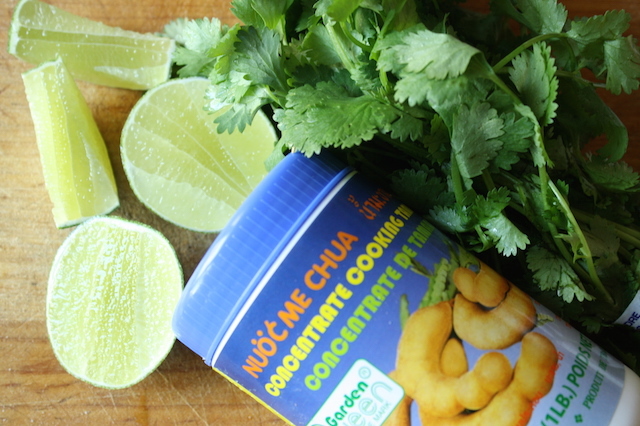 Note: this recipe uses Thai tamarind concentrate, found in Asian markets. It is quite thin and liquidy unlike the Mexican tamarindo, blocks of Indian or Thai tamarind paste or the pods (which I don’t even know what to do with). While I’m sure the later two will work, I’ve never used them so I can’t speak to their substitutions. For the wings, I like to leave them whole for this one but if you prefer the separated drumette/flats, go for it. I also like to give the wings a bit of a baste with the sauce 2/3 through cooking to pick up some color – the high sugar content in the glaze gives some good browning. You don’t have to roast these in the oven – grilling works quite nicely too. Preheat the oven to 450°F. Line a large sheet pan with foil and spray with vegetable oil. If you have non-stick foil hanging about, this is the time to use it. For the wings: In a bowl, combine the flour with the salt. Spread the wings on the prepared sheet pan in a single layer, top side down, and spray lightly with vegetable oil. Roast the wings for 20 minutes, until lightly browned. For the glaze: In a small saucepan over medium-low heat, warm the oil. Add the garlic and cook slowly, stirring constantly, until translucent and fragrant, about 1-2 minutes. Remove from the heat, add the tamarind paste, honey, vinegar, five spice powder and salt; whisk until smooth. Bring to a boil then simmer to reduce by more than half, until really thick and syrupy, about 4-5 minutes. Transfer about ¼ of the sauce to a small bowl for basting. After 20 minutes of roasting, use the ¼ of reserved glaze and brush on the partially cooked wings, flip and brush again. Rotate the pan and cook another 10 minutes. Place the cooked wings in a bowl and drizzle with the remaining glaze, tossing to coat. 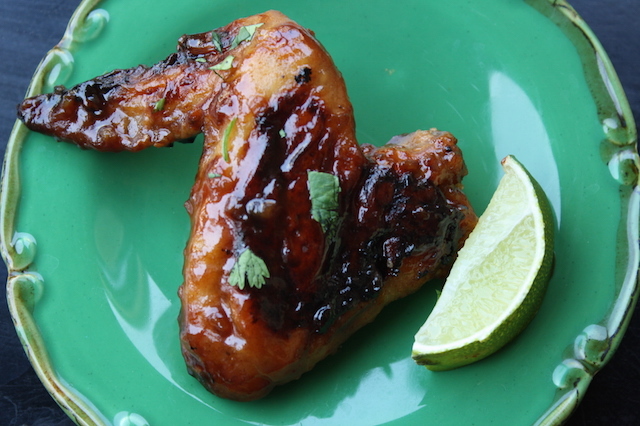 Transfer the wings to a serving platter and garnish with cilantro and lime wedges. Serve hot or room temperature. Do ahead: you can make the glaze 1-2 days ahead and refrigerate until needed. Rewarm before using. I used to go to the bother of getting tamarind pods from the local Mexican market and making my own tamarindo puree for cocktails and bbq sauce, until I found the ready to go stuff in the Asian market. There’s no difference in taste and it is a huge time saver. We like our wings around here with lots of heat. Have you tried adding some serrano or chipotle chiles in adobo to this sauce? I haven’t because I like the tangy, sweet, sour aspects of this one but you absolutely could and it would be a great addition. I think sambal paste, in particular, would be nice or the fruitiness of a little habanero. looks awesome and I have a nice can of that concentrate just waiting for a purpose!